Do you miss the comforts of Home? Home-cooked meals in your own kitchen. Laying out by the pool. Beautiful natural landscapes. Long walks with your dog. BBQs with friends. Tired of that sterile 'youth hostel' feel? Looking to break the monotony of city traveling? Then you've come to the right place! Welcome to the Perugia Farmhouse Backpackers-- Your Home Away from Home!! We were voted No.1 in Perugia in 2006..7.8.9 etc.. by Hostelworld customers! We are located in an authentic 250 year-old farmhouse situated right outside the historical center of Perugia. We are a backpacker-friendly organic farm B&B, with horses, dogs, donkeys, goats, chickens, sheep, geese, interesting local, cultural activities, a swimming pool with breathtaking views, and our new TIKI BAR. In a few words, 'The fun of a Hostel, the relaxation of an agriturismo Farm Stay' with a beautiful 360° view of both the city and the rolling hills of the Umbrian Countryside in the Green Heart of Italy! Thanks to our strategic position, the city center is only a short bus ride away. Feel immersed in nature, and at the same time, enjoy the beauty and the culture of historical Perugia and surrounding towns like Assisi and Passignano sul Trasimeno! 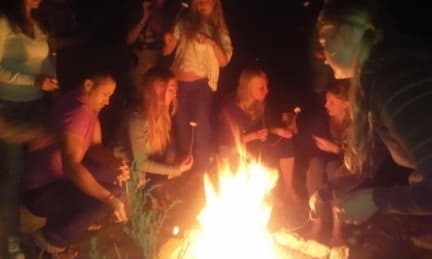 The farmhouse is a place where you can relax, get in touch with nature and enjoy cultural activities at and around the farm; for all of those night-owls, we also have a designated area at night where parties and socialising are welcome. Such an environment is the best way to meet people from all over the world! We offer differen accommodations, PRIVATE rooms (B&B rooms with breakfast included) and DORM rooms (Hostel rooms with purchasable Breakfast); we also offer accommodation at our 'Rustic Campsite', an 'Agri-Camping' designed for tents, and just few Camper and caravans, ideal for families and for those who love the outdoors and natural living. Also available is our Little Wooden House in the garden with our fruit trees where you can hear the relaxing sounds of nature and enjoy a beautiful view of both the farmhouse itself and the surrounding landscape. 24 hours check in (let us know in advance) and no lock outs! -- BBQ / Pizza Party/Pool Party! Don't miss our BBQ or pizza party, where we cook in our historic oven! Don't miss a guided factory tour, the choco museum and lots of chocolate samples!! -- Wine Tasting/Winery Guided Tour; Perugia's Favorite Winery -- Cantina Goretti. Just 5 minutes away by car or a 40 minute scenic walk on hills and fields. Discos, pubs, restaurants, and gym within 1 km from the hostel; golf club within 3 km; Warner Village Cinema & Shopping Center within 3 km. PURCHASABLE breakfast for HOSTEL dorm rooms (Hostel accommodation) small for € 3,00 with just hot drinks, bread, jam, and packaged croissants - or B&B breakfast for € 6,00 - also: a communal kitchen is free to use to prepare your own food! There is no service on Sundays, so Sundays might not be the best day to depart/arrive, but if you are planning on traveling that day, let us know and we can tell you about the alternative bus route to reach us! prices displayed are for a minimum stay of 2 nights; otherwise, you have the possibility to book 1 night and pay a fee of 2 euro per person (5 during high season). A min. stay of 2 nights is required during Festivals, Sports Event, Bank Holidays. Special packages or offers are not valid during peak periods. ***BED TENT: by booking this, you get a tent with blanketts. I stayed here two years ago and had such a great experience that I made sure to come back and visit it again when I was in Perugia. Laura and Michele were really helpful with giving us directions and even offering a ride when we were headed the same way. The breakfasts are always wonderful with the fresh, warm croissants. Our room with a private bathroom was very spacious for the two of us and all our luggage. The upstairs kitchen was well supplied with cooking utensils which made cooking easy. The perfect place to getaway from all the city life. It’s so peaceful out here and everyone look out for one another. Stayed a week here and would stay another if I had more time. Thank you everyone there that make my trip unforgettable. I ended up extending my stay at the farmhouse as I enjoyed it so much. Laura and Manuele are wonderful and the volunteers that I met as well as other travelers were great. I stayed in the dorm and tent and both were very comfortable. It is a special place, and I will definitely be back!! Probably the best place I've started in Italy, even if it was just for a couple of days. It's out of the city in a fantastic countryside setting, however still very easy to grab a bus into town to explore the city of Perugia. Both hosts and guests are very relaxed, there's shops and bars in walking distance and the rooms and facilities at the farm are excellent. Don't expect to really party it up here, but you'll have a fantastic time regardless. Loved it, will be back! Such a fantastic place to relax! 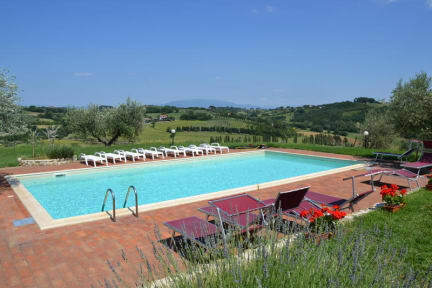 Out of the city centre, perfectly great for relaxing by a pool and for beautiful walks! Very genuine lovely staff and always happy to help. I'll be back! This was a great place if you’re looking to relax for a few days. We found that for us, it was just a bit too far from the city centre and there wasn’t much transport around. Staff were really nice and drove us to the next closest bus stop on the Sunday (when the buses aren’t running to the nearest stop) and the breakfast was good value too. The rooms are spacious and clean, and the farm is so scenic, definitely worth checking out! The farmhouse was a great place away from the city. The staff were friendly however the addition of security lockers would be nice, we fortunately had a car to lock our valuables in for a bit of peace of mind. There is a fantastic bar with a focus on great beer and food a little ways down the road, just ask the owner. There was nobody when I arrived I felt like I went to somebody else house. the house was very very old I think likely 200-300 years old. but stays nice condition. very very vintage for me. an awesome experience for me. the best was too soft and hard to straight my body it was noisy when you turn around body and quite low always hit my head when I wake up. but excited since it was never had experience. the toilet was very very old and likely open door you can't close it tight. so vintage!